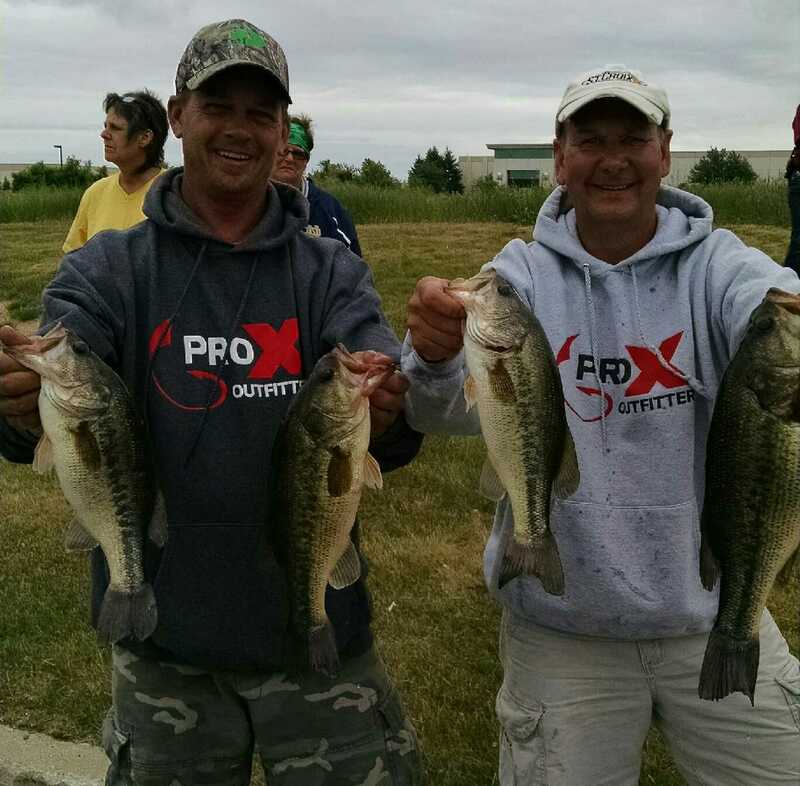 Fitting in many ways, "Team ProX Outfitters" (notice hoodies proudly on display), Aaron Krider and Bob Bruick brought a 10.25 pound limit of largemouth to the scale to win a $25 gift certificate redeemable at Schnelker Marine or online. 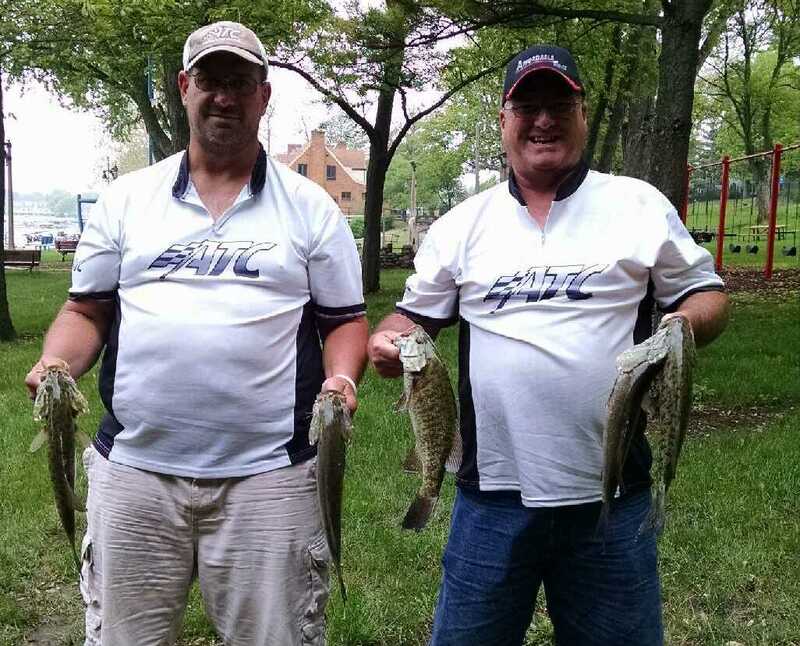 A mixed bag of smallmouth and largemouth weighing 14.87 pounds by 2015 Season Champions John Gipson, Jr. and Tom Noe won them a tackle pack provided by Rocky Brook Sinkers. Perhaps more importantly, though, was it placed them on top of the West Division Standings. The R & B Bass Circuit has always prided itself on the conduct of its members, but none was more blatant than the selfless actions Team ATC, (Aluminum Trailer Construction & Yoder Construction) Dan Truex and Tim Pugh (right) put on display at Lake Michigan. 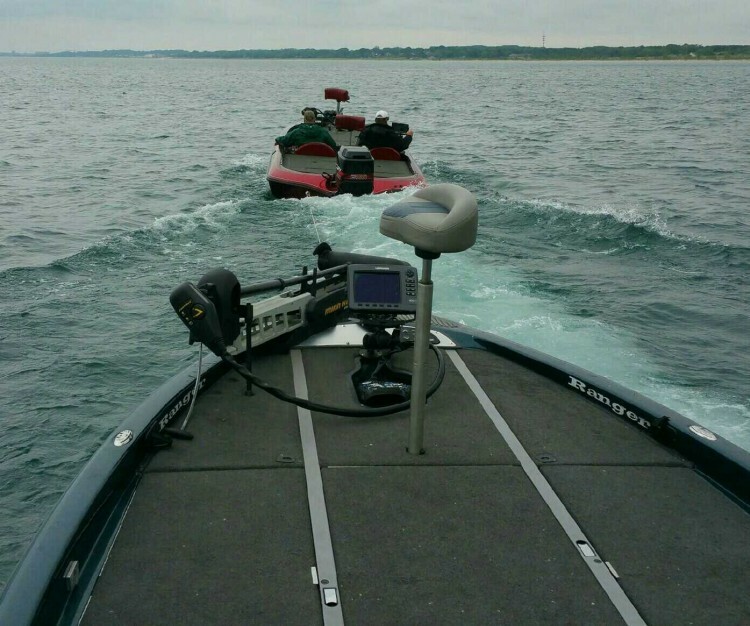 After calling it a day and at the ramp, they received a call that Steve Prange and Josh Stalcup were stranded 9 miles out on Lake Michigan with a dead motor. Without hesitation, Pugh and Truex turned around, idled 15 minutes to the mouth, drove 9 miles, and then spent 90 minutes towing them back to the ramp. "If it wasn't for them, we might still be there," offered Prange. 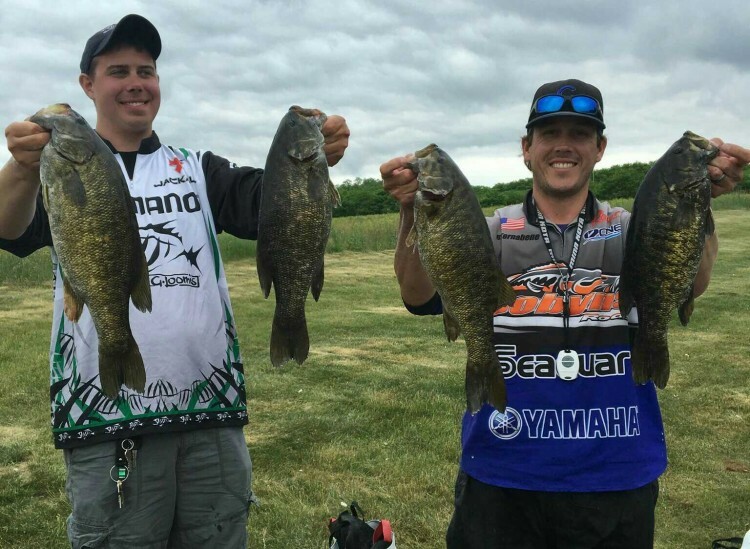 1st Place: Lake Michigan gurus Ross Tornabene and Bobby Bergren (owner and personality of Stray Casts) captured 18.90 pounds of smallmouth bass to win and secure $627. Their biggest fish, a 4.44 pounder, was also the second biggest fish of the event, which won them another $56. In all, their work awarded them $683 and a certificate from Rod Bender Baits. 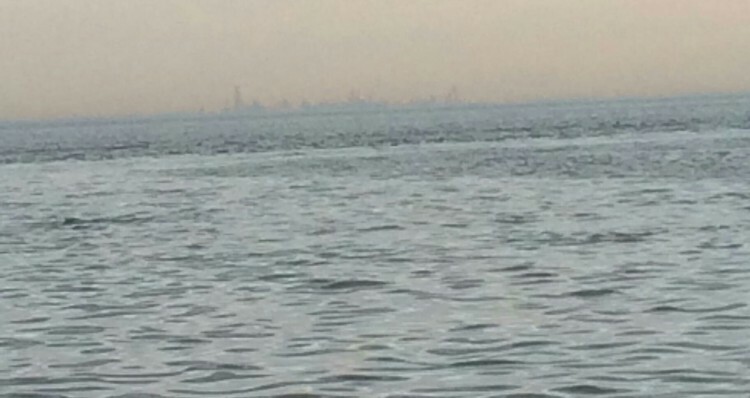 Their day began with a 30 mile run to Chicago to target bedding fish they had located in practice. Unfortunately, not all of their fish were still locked in place stirring initial panic. Luckily, they found others. Armed with drop shot rigs and small tube baits, they scrounged together a limit that included a pair of 4 pounders. A few of the fish came with the aid of a Flogger. “Some of the beds were as deep as 11 feet,” Tornabene admitted, “Bobby was looking through the Flogger and actually told me, ‘He’s got your bait!’” On another fish, Bergren used the Flogger to hook his own fish. Fat chance. Luck favors the prepared mind, and their years and countless hours on the lake paid in spades. 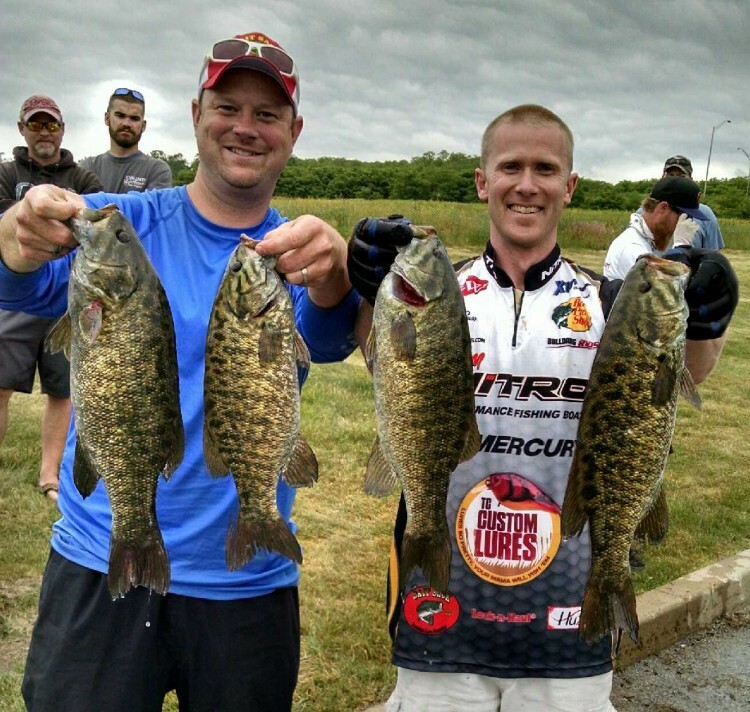 These fish made what would have been a tight race into a blowout by more than two pounds. Their stringer now stands as the second heaviest in the R & B Bass Circuit's seven year history. 2nd Place: Tournament directors Andy Buss and John DuPont brought a 16.73 pound limit of smallmouth bass to the scales to win $335. 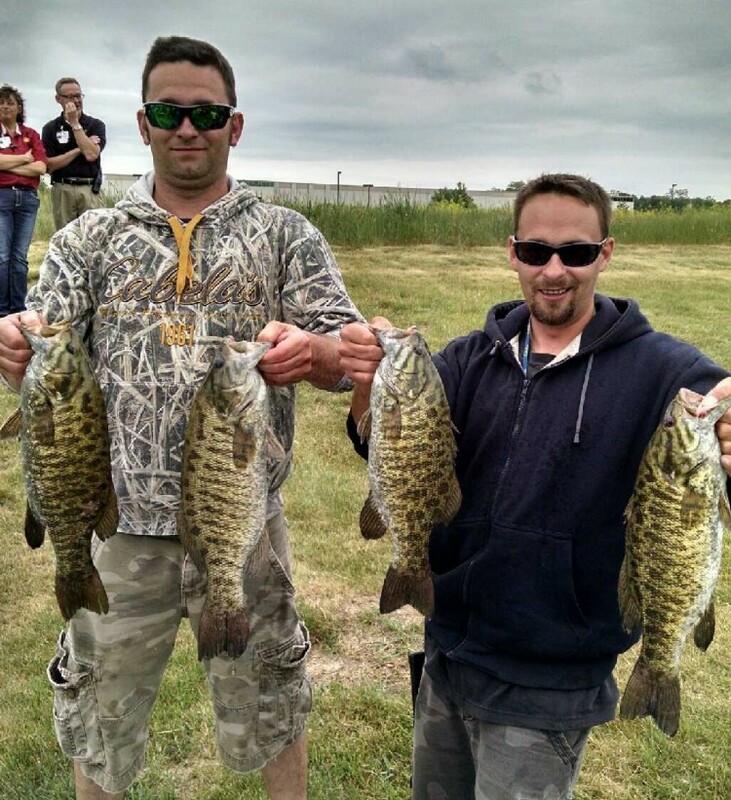 They stayed in Indiana waters and caught all of their bass off spawning beds. “Thursday, we had located spawning smallmouth 10 miles west of the ramp and spawning largemouth 30 miles north,” shared Buss, “but we were not sure which to go to first.” Ultimately the team determined that numbers favored the largemouth, but smallmouth had the better quality. Stop #1 produced two fish in as many hours, but they told the team how to focus their energy for the rest of the day. “Those two fish (a 3 pounder and 15 incher) came off beds, and we saw several other spooky fish on beds, thus, we knew we could target bedding fish for the remainder of the day,” admitted Buss. After two hours there, they went to the smallmouth found in practice and finished their limit in just 10 minutes. They then added two 4 pound fish and culled several times before heading back to the community hole. Once back, they culled several more times on their way to the 9th heaviest stringer in R & B Bass Circuit history. 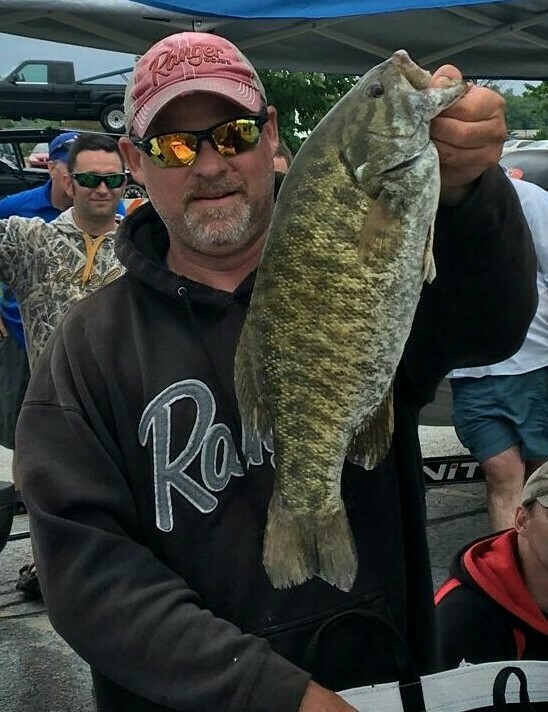 3rd Place: Tom Billings and owner of TightRope jigs, Ryan Whitacre, used a drop shot rig and TightRope jigs in Illinois' water to bag a 16.40 pound limit of smallmouth. Their limit was complimented with the biggest bass of the event, a 4.52 pound stud. 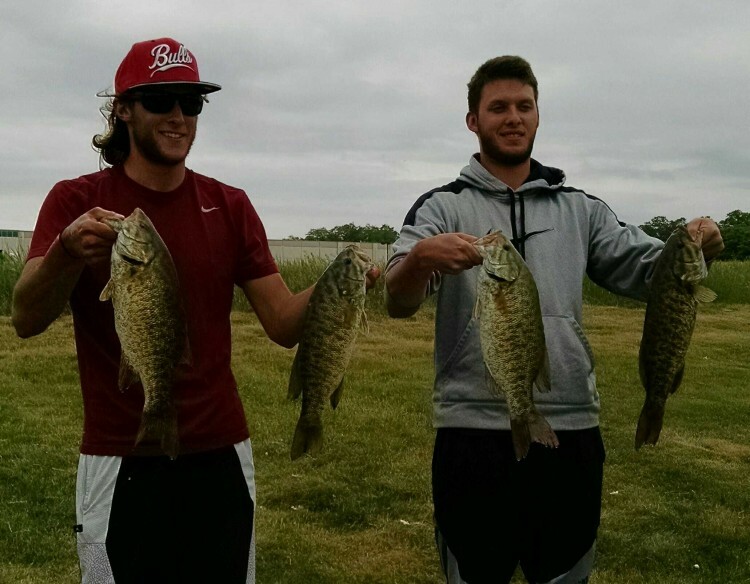 The high finish awarded them $219 and the big bass added $224, making their trip worth $443. received all of their efforts and they yielded 7 keepers total. 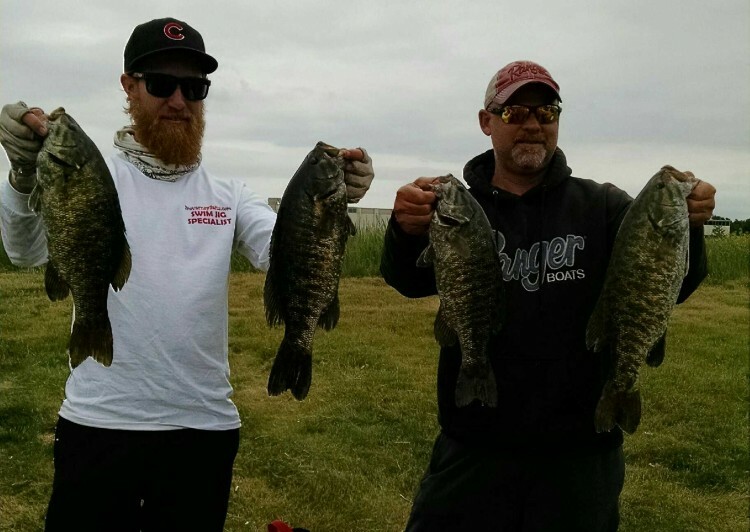 The big bass (right) bit the drop shot rig for Billings, “Ryan had the Power Poles down and was working a fish on a bed. To pass the time, I began fan casting in deeper water where she bit.” Unbeknownst to Billings, that big fish was sitting on its own bed. Minutes after landing her, Whitacre caught the fish he was targeting. 4th Place: Apparently, an encore presentation, after winning the Tippecanoe event, from Michael and Kyle Kaser was ordered. Another top 5 finish now has them poised to make a run at the 2015 Season Champions, John Gipson and Tom Noe, as they trail by just two points in the Standings. Despite limited experience, the duo still managed a 15.44 pound limit to claim $175. Kyle admits, “This was only our second time on the lake, ever.” Last year in the Lake Michigan tournament, they competed in a 14 foot aluminum boat, stayed in the ditch, and still managed a 6th Place. This year they spent time on the lake just one time, the day before the event. During practice they found several bedding fish and then targeted them during the event. In fact, with Strike King finesse worms in the green pumpkin color scheme rigged both wacky and on a drop shot, they caught all of their fish, except one, off of a bed. The lone fish fell victim to a jerkbait in the last hour, which was a ½ pound cull. It would be privy of the reigning champions to take notice of the team knocking on their door. 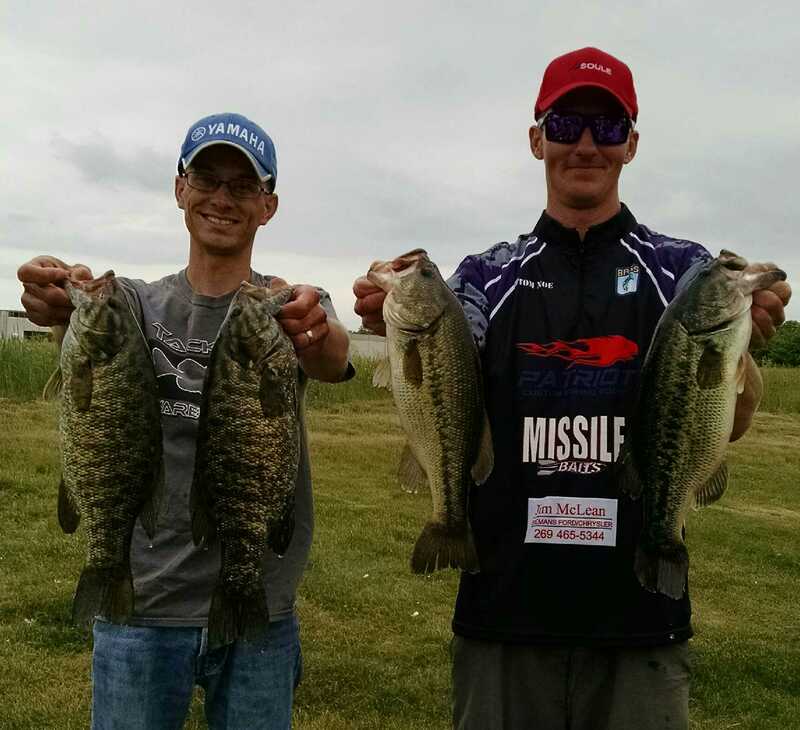 5th Place: This was only the third time Robby and Jason Rendant had fished the “Big Pond,” yet, they still stuck 15 fish on the main lake to weigh 15.00 pounds and claim $102. During the final hour the team also made two big culls along a steel wall with the worm. The fourth annual Lake Michigan Big Bass Bash is scheduled for June 25. This charitable event raises money for veterans. Click on the link for the details.